Well, we almost didn't have a TCP Tuesday challenge today! It's my turn to be The Hostess With The Mostess, but I had totally forgotten that it was my turn until Toni reminded me. (Maybe because I've got a little bit going on?) Thanks so much, Toni! Please forgive me for this being a little late! 4. 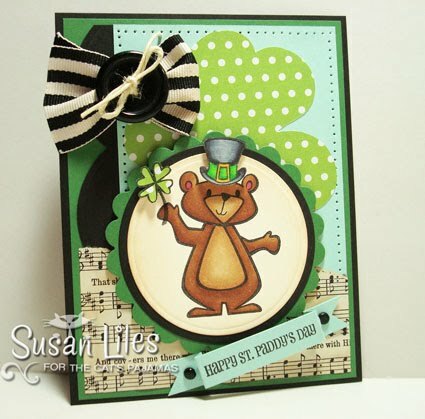 If you'd like to also upload your piece to Splitcoast Stampers, use the keyword TCPTUES103 for this week. SUSIE Q-TIP: Don't forget about that fancy die cut machine you just HAD to have (Cricut, Slice, etc.). A simple shape that matches the theme of your card or project can go a long way. Just letting you know I am thinking of you.....and we are tracking a little behind you although we got our diagnosis from Ms. Jaffe as we live right here in Maryland. I keep you in my prayers! We don't have a treatment plan yet. Too, too cute! Love that shamrock! sweetie, we all screw up stuff in the good times, so now that you're in a rough patch, do not feel bad if anything gets skipped. This is supposed to be fun. We're all pulling for you. did I tell you my brother finished his treatments and is eating again. Wohoo, who'd'a thought you could be happy to be putting on weight?